Risk of a more frontloaded Fed hiking cycle should keep Banxico on a tightening path, beyond this week's meeting. In fact, given the focus on monetary policy synchronicity with the US, the risk is that Banxico opts for more hikes than currently expected. Policy guidance should turn progressively less hawkish, as inflation comes down, and if FX concerns ease somewhat, amid signs that NAFTA negotiations should be delayed. But an attempt to decouple from the Fed may not happen ahead of the July election. Mexico’s central bank (Banxico) should continue to diverge from the other regional central banks and extend the rate hiking cycle with another 25bp hike on Thursday, bringing the policy rate to 7.5%. This would be in line with the more hawkish policy guidance adopted ahead of the December meeting, which marked the resumption of the hiking cycle and concluded with the dissenting opinion from a board member that voted for a larger 50bp rate increase. Authorities justified their decision by highlighting the persistent inflation challenges resulting from the price shocks seen throughout 2017, along with the highly uncertain backdrop for 2018, marked by NAFTA negotiations and local elections. But perhaps the primary reason to follow through with a hike this week, which would be the first time since May that a Banxico hike does not coincide with a Fed hike, is the recent rise in inflation expectations. In particular, Banxico's own survey showed that market expectations for 2018 inflation are no longer anchored, having risen over the past couple of months to 4.1%, ie, above the targeted range. 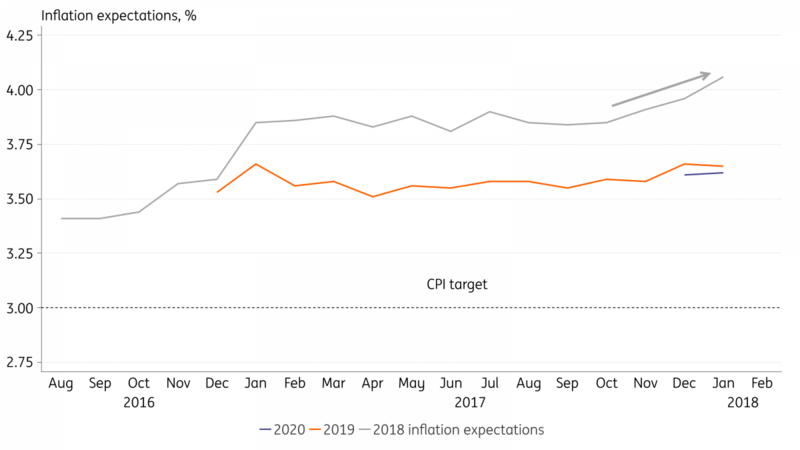 This marks an important contrast with the official central bank view that inflation will end 2018 near 3%; and should leave Banxico no choice but to match market expectations and hike this week. Inflation data for January, to be announced hours before the meeting, is unlikely to impact the central bank's decision this week, but it should help guide market expectations for future policy decisions. The release should confirm a sharp drop in the yearly CPI rate, thanks to the favourable base-effect resulting from the one-off fuel price adjustment in January 2017. As a result, in YoY terms, inflation should fall about 1.2ppts, from 6.8% in December to 5.6% in January. Confirmation of a low January CPI print should help stabilize inflation expectations especially if the drop is broad-based, including services and core components, ie, beyond the widely expected drop in fuel. But prospects for a quicker convergence to the target should remain limited. As indicated by the consensus survey, the yearly inflation rate should re-enter the targeted range (ie, 2-4%) only next year. Benign base-effects should help reduce headline inflation by more than 2.5ppts this year but it should remain uncomfortably high due to several factors including stretched labour market conditions, trending around full employment, the unfavourable inertia/indexation pressures, and the inexistence of a clear output gap, as evidenced by the relatively upbeat 4Q GDP report. Apart from near-term inflation data, FX and US Fed decisions also rank very high in Banxico’s decision-making process, and should remain critical factors that will help determine if the bank will follow through with additional hikes in its upcoming meetings, scheduled for April 12, May 17 and June 21. In particular, the higher risk of a more frontloaded monetary normalization in the US has added material upside risk to the near-term policy-rate trajectory in Mexico. a more frontloaded monetary normalization in the US would add material upside risk to the near-term policy-rate trajectory in Mexico. The prevailing view within Banxico regarding the need to maintain monetary policy synchronicity with the US has fluctuated over the past year. After matching a Fed hike in the June 2017 meeting, bank officials indicated a willingness to decouple from the Fed, presumably because the aggressive frontloading in Mexico (400bp in hikes vs 100bp in the US) would provide sufficient room to manoeuvre for Mexico to conduct monetary policy independently from the US. At that meeting, Banxico signalled that change by altering its reaction function guidance, downgrading its sensitivity to US rate hikes from second to third, ranking the FX pass-through and the output gap ahead of Fed moves. The issue was never settled among board members however, and at the November meeting, Banxico once again altered the ranking order in its reaction function guidance, with US rate decisions being upgraded from third to first. This ranking order was kept in December. In principle, even though Banxico has hiked much more aggressively than the Fed, the bank's operating assumption is probably that it is still important to match any Fed hikes, in an effort to limit FX market vulnerabilities, given the still-challenging short-term inflation and FX outlook. A preference to err on the side of caution would lead policymakers to postpone the eventual decoupling to 2H18, after election-related risks no longer pose a major threat to the stability of local financial markets. As a result, if the US Fed hikes twice during the first half of the year, a higher-likelihood scenario following last week’s US labour market data, the April and June meetings would be strong candidates for future rate hikes by Banxico. This would imply a higher risk of more rate hikes than is currently expected for 1H18. Moreover, a substantial fall in yields resulting from a decisive shift in policy guidance, emphasizing the potential for decoupling from the Fed, may not happen until electoral risks dissipate, after the July 1 election. Rate hikes could be avoided if the peso surprises, relative to our base-case scenario, and strengthens materially in the coming months. Banxico lists the FX pass-through as the second most important driver for policy decisions, and the likely postponement of the deadline for the conclusion of NAFTA negotiations should be supportive of the MXN as it would show that a negotiated compromise is still seen as viable, sharply reducing the likelihood of an imminent US pull-out from the negotiations. Overall, the balance of risks still point to a weaker currency in the coming months but, as NAFTA worries move to the backburner, FX catalysts should turn increasingly to politics and economic fundamentals. In particular, investors should focus on the risk of a victory by left-leaning candidate Lopez Obrador (AMLO) on July 1, and what that would mean for the outlook for energy sector policies. Still, assuming NAFTA-related headline risk dissipates, at least for now, we expect the peso to follow a slightly stronger trajectory than we had previously expected (ie, rising towards 20 instead of 21-22), even if AMLO maintains his leadership in the polls. After the July 1 Presidential election, and assuming a market-friendly result in the presidential race, or the announcement of a market-friendly economic plan by AMLO, the currency could gradually retrace back towards its medium-term fair-value. That value would be closer to 18 if NAFTA survives and closer to 20 if the treaty is abandoned. The stronger peso, and the more comfortable inflationary path expected for 2H18 should meanwhile pave the way for Banxico to start considering rate cuts, later in the year. But prospects for continued hikes by the Fed should keep Banxico cautious and limit the scope of any monetary easing cycle in the foreseeable future.